PAUL JAY, SENIOR EDITOR, TRNN: Welcome back to Reality Asserts Itself on The Real News Network. And I’m Paul Jay. We’re continuing our discussion about the 40th anniversary of the resignation of Richard Nixon after the Watergate scandal. And joining us again in the studio is a man who was involved in investigating that and much more, Burt Wides. He was part of the Senate staff that started the Watergate investigation. He was part of the creation of the Watergate special prosecutor. He also was a lead investigator dealing with the CIA for the Church Committee and a whole lot more. And his biography’s down below. And watch part one, because we more expanded biography there. BURT WIDES, ATTORNEY, FMR. COUNSEL TO U.S. CONGRESS AND JIMMY CARTER: You’re welcome. 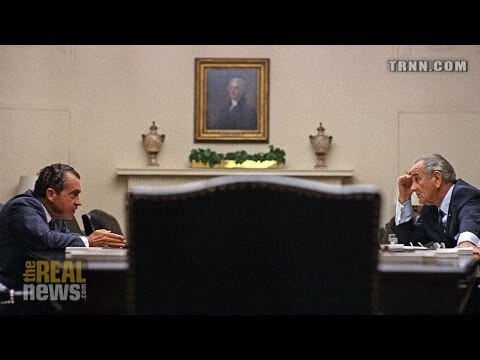 JAY: Before we kind of move on into sort of a more bigger picture conversation, I mean, Richard Nixon is remembered for the Watergate scandal. But what should have been the thing that should have sunk Nixon , the far bigger scandal with Nixon, which he–not should he not have to resign, but he should never have been elected president if Johnson had let this go public. Johnson said he was on the verge of a peace deal with the North Vietnamese and tells Senator Dirksen in a phone conversation to tell Nixon that he’s essentially acting like a traitor, because Nixon had sent an emissary to the North Vietnamese saying, if you’re going to make a peace deal, you’d better make it with me, because I’m not going to honor it if you make it with Johnson. And Johnson says to Dirksen–and we’re going to play the tape now, in just a few seconds–where he says tens of thousands of American lives are going to be on Nixon’s head, because I can end the war now and he’s preventing me from doing it. Here’s the Johnson tape. JAY: So that was Lyndon Johnson talking to Senator Dirksen, who was the go-between between Johnson and Nixon. So this kind of–completely above the law, what Nixon was doing had to be illegal. To sabotage American peace talks with the North Vietnamese was already his modus operandi. But more than that, Johnson covers it up, ’cause he knows Nixon’s going to beat Humphrey. He says that in one of the phone conversations, that he’s–actually says to Dirksen, tell Nixon he’s going to win. We all know he’s going to beat Humphrey. He’s going to have his way. Why screw this up now? And it’s not just tens of thousands of American lives; there was probably more than how many million lives of Vietnamese and Cambodians that wind up dying because Nixon prolongs the war for years. JAY: Yeah. So, I mean, the guy is essentially involved in criminal activity right from–who knows what he was before he gets elected, but even to get elected he creates a conspiracy. But my point is is that is that not actually systemic, that if you’re going to be the global hegemon and you’re going to have a national security state, you’re going to do these things? Because the rationalization is we’re the most powerful on the globe, and we can get away with this stuff, and I’m the president–I’m just going to do it. So you get the Church Committee, which exposes all the rotten activities CIA was involved in, and FBI. It’s only a few years later Reagan is right back at the same stuff. WIDES: I don’t know with regard to the rights of Americans that before 9/11 it was all back to the same. And as I think I mentioned before–. JAY: So this is the difference between what they do domestically and what they do internationally. WIDES: Yes. And I think the main impact of the Church Committee by far was with regard to the rights of Americans in terms of investigations and surveillance on national security grounds. And I think it was substantially changed. I think after–I’m not saying eliminated, but I think substantially reduced. After 9/11 it was all bets are off. And one thing I didn’t mention in the previous segment, even with regard to the foreign affairs, the CIA, as has been discussed on your programs, overthrew all sorts of countries and did lesser but still very debilitating covert action in other countries. And there was no record that the president had ordered it. So there was the concept of plausible deniability. Even as to the assassination plots, during the Church Committee, I think it was Secretary McNamara, Secretary Rusk, McGeorge Bundy, or two or three of them came in and said, of course Bob and John Kennedy wouldn’t have approved of that. One reform from the Church Committee still in effect today, and, I think, largely practiced, was the requirement that for any major covert action, not planting an editorial in the New Delhi Times, but a major one, the president has to sign a finding that it’s essential to national security and promptly tell the Congress. So even as to foreign affairs, there was a major restriction. And then it’s of course up to the intelligence committees as to what to do with it. And then you get into separate questions of to what extent the public knows and so forth. JAY: And pre-9/11, do you think some of this actually worked? WIDES: Yes. Yeah. I think–first of all is you never know what you don’t know, as Secretary Rumsfeld famously said. JAY: Which I always agreed with him. I don’t know why he got such heck for that statement. I always thought it was a pretty good statement. WIDES: Well, it’s true. So when I was counsel to President Carter for oversight of all the intelligence agencies, he issued an executive order to protect the rights of Americans, and it included the requirement that an inspector general and general counsel at each agency involved in intelligence would stay on top of what was going on in their agency, and if it raised any question of legality or propriety, report it to me. And then, if I investigated and thought it was serious, I’d go to the board, which was Governor Scranton, Al Gore Sr. (Vice President Gore’s father, who was a senator), and another person. We would take it to Carter if they thought it was sufficiently serious and do something about it. And I think in that era right after Watergate–Stansfield Turner, pretty straight-arrow admiral who was the head of the CIA, and the FBI was William Webster, before that Clarence Kelley, the police chief of Kansas–I think things were dialed way back. Did they start creeping up again? Yes. But I think before 9/11 and after 9/11 is like night and day. JAY: I get it. But isn’t there–there’s a tradition that at the highest levels you’re going to get pardoned if you get caught. I mean, there’s Ford pardons, the pardons that Liddy gets, there’s the pardon of–you know, Cheney pardons. Obama didn’t prosecute; it amounted to a pardon. I mean, they should have prosecuted Bush-Cheney for an illegal war, for torture, violating FISA, any number of things. WIDES: Well, the worst example, just to confirm what you’re saying, is that after Iran-Contra, there was a special prosecutor, highly regarded Republican, former judge, deputy attorney general under Eisenhower, Walsh, and he was in the middle of prosecuting people for violating all sorts of laws. And he was about to go forward with a trial of the secretary of defense, and one of the issues was going to be what President Bush knew about it, and his vice president. And as the trial was about to go forward over Christmas, Bush pardoned him before the trial. JAY: So there’s–kind of go back to sort of the big point of this, and then we’ll kind of get a little–I’ll suggest it again, and we can get into it more a little later. But the idea is is that it’s kind of inherent if you’re going to be the hegemon and you’re going to be the world’s biggest military and you’re going to have such a militarized economy and such an enormous military-industrial complex, and it’s part of what actually Eisenhower warned about. It wasn’t that Eisenhower was a pacifist, by any means, and his warning about beware of the industrial-military complex was kind of what it would do to kind of warp all the institutions of government. WIDES: Well, I think the role that the military-industrial complex plays in our economy and the influence it has in our foreign policy is what Eisenhower was talking about. I think the question you asked earlier is: by the time someone does what is necessary and gets to the top of the pole or is the president’s top adviser, does he feel he can and should get away with anything, even if it might be illegal? And I think there it’s a matter of degree. I think that people tend to convince themselves it’s necessary. Lyndon Johnson, the reason why (the CIA in the Church Committee revelations) [Johnson] pressed the CIA to spy on thousands of Americans was because he really, I believe, couldn’t believe that there would be that much indigenous opposition to the Vietnam war; it had to be the Russians controlling and financing. And that was what he told them to find out. And when they couldn’t find it, he kept saying, look harder. And then Nixon. And they started not just to investigate people they had some reason to suspect might have something to do with Russia, but other people simply ’cause they were active in the antiwar movement, to see if maybe they could find a link. I think that when you also get to the top, there’s a sense that you know what others don’t, and if it’s a real threat, that’s your responsibility. But I still believe, after all the investigations I’ve been involved in, that there are people who get to the top, who become president or top advisers, who have some lines they wouldn’t cross. They might go further than you or I would and feel, I just can’t do that, it’s not right, but I think for many of them there are lines where they say, no, we just can’t do it. And if you give me a little time on some other segment, I’ll give you some examples. JAY: Well, if there are lines, you’re saying after 9/11 most of those lines disappeared. WIDES: The basic difference between before 9/11 and after 9/11 is this. After the Church Committee investigations, not all the people in the street of America, but those who follow current events and read the papers and so forth were sufficiently outraged that there was enough pressure, even though there was pushback from the intelligence agencies, the Pentagon, the White House, to get the reforms I mentioned, whether they were somewhat weakened over time or how well you think, but they were done. After the next big revelation, which is really Snowden and the NSA, I’ve detected–didn’t detect; I’ve heard from the same kinds of people a very, very different take. And the take is: I don’t care even if you say they’re spying on my First Amendment activities, my political dissent or whatever, and I don’t even care if they cannot prove that they used these techniques and it blocked terrorist attacks; if infinitesimally it would decrease the chance of my husband getting blown up at Grand Central Station, just do it. I mean, it’s really a dramatic difference. JAY: And in terms of the blurring or elimination of the lines, it’s also now acceptable for a president to sit in his office with advisers and decide to drop drones on people’s heads, even sometimes if they’re American citizens. I mean, there seems to be no lines here. And this recent spat between the Senate Intelligence Committee and the CIA, it seems to be more territorial than about any substantive thing that this intelligence committee is really going to be an oversight committee, ’cause as far as I know, most people have considered this, certainly since 9/11, completely a rubber stamp, if not before. WIDES: Well, there are some people within the committee who have been pretty vigorous. But the Republicans and some of the senior Democrats have been thought to be too much of a rubber stamp. JAY: Or an illegal war. WIDES: –because he was a top adviser to Tenet when Tenet headed the CIA. He was an enthusiastic supporter by all accounts of the extraordinary techniques, intensive interrogation. At his hearing he said that he had opposed it, but elsewhere it came out that what he had opposed or what he had raised as a concern was that it might come back to hurt the CIA, not it was terrible. In the White House, in my view, he was really the national security adviser. The title was just for counterterrorism. So now for Obama to point out that he didn’t tell the truth–unless you believe that he didn’t know about what went on when they wrongly got into the committee staff’s computers–but in general for Obama to say that with Brennan’s participation all this terrible stuff went on is a little embarrassing. And I don’t think you’re going to get anything on the substance of the report out of the White House. In terms of the food fight (which I call it), given the intelligence committees being pretty much a rubber stamp or not taking vigorously its oversight role, I think you’re right. I think it was when it came out that Brennan or people under Brennan at the CIA had hacked into the committee staff’s supposedly inviolate computers, and even more when the general counsel at the CIA referred to the Justice Department a referral as to possible criminal actions by the staff, that chairwoman Feinstein finally went ballistic, gave an incredible speech on the floor that astounded everyone, but now has sort of retreated, and in the fight over what will be made public is willing to negotiate, even though the committee feels that the redactions were made not really only for security reasons. JAY: And as you’ve pointed out in the last interview, if the Senate wanted to release the staff, they don’t need anybody’s permission. They just need to vote to do it. WIDES: That’s right. And it’s been done once, by the Republicans. Even the reporters who were aware of the provision, most reporters say, well, it’s up to the president and the CIA. But even the reporters aware of this seem to feel it’s never been done. And when Carter was negotiating away the Panama Canal to the Panamanians, there was such an uproar that the Republicans were able to get a majority vote in the committee and in the Senate and, over the objection of the executive branch, make public some hitherto classified negotiations. JAY: So, just quickly, we’re near the end of this segment, and Burt’s agreed to come back. I mean, he’s a living history book of all of these periods, so we’re going to do a lot more. But some of the talk of reforms of the NSA and such that’s come out of the Snowden business, is any of that substantive? Or is it window dressing? WIDES: It started out substantive, and it’s been periodically diluted. Congressman Sensenbrenner, conservative Republican who was the author of the provision that they claimed authorized getting the metadata on phone calls of everyone, he and the liberals were astounded at that claim. He, Congressman Conyers, and, in the Senate, Senator Leahy put in the USA Freedom Act to make substantial changes, which maybe in another segment we’ll get into. But in the House, which went first, the Judiciary Committee compromised with the Intelligence Committee and the White House and substantially weakened it. It still has some stuff. Leahy then put in a new version of his bill, stronger than the House, still backing off on some things. And we’ll see in the fall what comes out, but it’s been on a downhill incline. JAY: And again, whether you pass some regulation or not, is there any real oversight to see if it’s followed? NSA we know is handing information over to the FBI to prosecute criminal cases and doing end runs around wiretap, you know, pretending they made the case without the NSA, but we know they didn’t, and this has come out, more or less. And clearly that’s illegal. But it’s still going on, as far as we know. WIDES: Well, I’d say three things real quick. One, one of the reforms being debated as to how strong it will be is to have a public advocate in the FISA court when they authorize things, because right now there’s the government making its arguments and the judges. So it’s one-sided. There’s no one on the other side. It’s not really a case in controversy that in general you have to have. So that’s one thing. Cumulatively, what we talked about, the Pentagon Papers, Watergate, Church Committee, has produced a generation of judges more skeptical–not the FISA court, but other judges. So when the ACLU or someone tries to get access to something or someone challenges something, instead of just rubber-stamping, you’re seeing a little bit more–not nearly enough–of the judges not only being questionable but sometimes sharply criticizing, although the state-secret doctrine still–and Obama’s been worse than Bush–allows them to get many of the cases dismissed. But you see stronger judiciary. JAY: Okay. To be continued. Thanks for joining us.